I recently criticised the Osprey book on (really) Ancient warships. The artist wasn't too happy about it but the book's content is the author and editor's responsibility, I feel, rather than his. Ancient Warships is not alone, however, in having some dodgy moments and being at a loose end I thought I would jot down some points of irritation with 'Greek Warship' -(New Vanguard 132). This book is really about the 'Athenian Trireme' NOT a general account of all Ancient Greek Warships. Why the ambiguous title ? This is just wierd. Are Osprey's editors so poor ? Call a spade a spade. As with Ancient Warship the general quality of illustration is mixed even before we come to the colour plates. Photos of the rigging p.13 which just happen not to have the foremast included ? - then why have it at all ? A photo of a hoplite making a libation p.15 is presented as being relevant to a marine from a trireme.. The Vulci bowl which potentially shows a pirate action at sea is presented using a photo p.41, that is almost illegible (see also p.4, This is a fault in many Osprey books. Could the reason be that an author's own photos - of inferior quality - be cheaper because they do not require rights payment or negotiations ? Other photos are great and fit perfectly to the text, so this is obviously not an insurmountable problem. 'northern seamen' do not use tholepins in pairs. 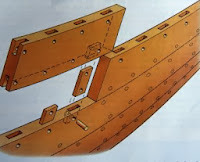 There is no illustration of the mortise-and-tenon method for joining planking strakes in a trireme's hull. The most characteristic specialised detail of its construction. -( but what relevance any of this this has to a' wargame book' I don't know...) The ancient warship book has an execrable illustration of this detail. Nerdy points maybe, but why 1 1/2 pages is used on the wood an Athenian trireme was built from in a wargame book is beyond me. Or perhaps Osprey think they are producing something else ? Rams are not 'bronze plated (p. 17)' the ram is a cast bronze element fitted to the ram timbers projecting from the prow of the ship. The trireme 'was not very seaworthy'. (p.21) It is not even worth pointing out the ridiculousness of this statement. The author obviously has access to Coates, Rankov and Morrison's works. And many Greek vase illustrations. Despite this, the helmsman is depicted repeatedly as occupying the skipper's chair and the skipper - trierarch stands behind him? Olympias and vases show the helmsman stood in front of the skipper on a platform in the middle of the quarterdeck. This way both can see for'ard. In plate E both helmsman and captain are shown dressed in the simplest tunics. Maybe the man in charge of the whole ship wore more than this - especially into battle ?! Plate F is supposed to show a periplous / (sail around)manoeuvre. This is NOT a periplous which was an outflanking manouvre where ships faced each other head-on. The illustration shows the 'anastrophe' /turn about) - named after a hoplite drill for deepening a phalanx. The positioning of the ships in this reconstruction are highly unconvincing. And the small map in the corner is. It is unannotated but I recognised it as Map 6. from 'The Athenian Trireme'. It is an overview of the action leading to the famous anastrophe attack at Naupaktos.Otherwise not mentioned in text, not a good presentation - editor's fault. There is a section entitled 'In Action' but not a single discussion or illustration of a sea battle. Lots of flummery aboyt naval strategy but no accounts of battles in a book about the Athenian trireme ? The only semi-batle-scene is Plate F and this manages to show a) deck troops milling around when they would have been sitting and b) screens for the rowers arranged horizontally where they could catch rain but not protect the rowers. A quote from Aristophanes' 'Knights' on p.8 offers no support for arguing a trireme was lightweight. Control of the sea WAS possible in the ancient world. Why else was the Mediterranean Sea a 'Roman Lake'? Why else did Athens not fear Peloponnesian sea power at the start of the war ? The author insists that amphibious raids could not do anything significantly militarily and then contradicts himself on the same page (p.22). Apparently the information we have about the later naval engagements in the Peleponnesian War is limited. This is only because Thucydides work stops in c.411BC. Plutarch, Xenophon, Diodoros, Frontinus, Justin etc don't count ? This comment alone makes one doubt the author's competance. Nuff said. 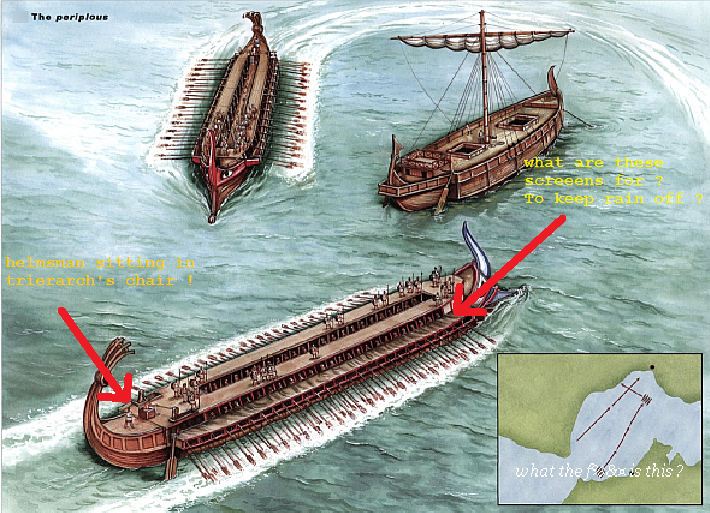 The other ancient naval titles from Osprey are Salamis and Actium and some references in others. The track record of Osprey in this field is not good. Most of the problem with Ospreys appears to be the authors lose focus and fill the book with stuff irrelevant to what these books are, which is background knowledge for wargamers and modellers. They are not history textbooks or academic works but this is what many of them try to do. And fail. Osprey cannot avoid criticism. They rely on the author to deliver accurate copy and have no critical editorial process. Of course what editor could range over the breadth of material Osprey bang out ?